Coppers; pigs; plodders; bobbies; blue heelers; the boys in blue; the fuzz; the heat; the law – whatever you want to call them, they sure know how to put on a good museum. 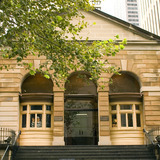 The Justice & Police Museum is one of Sydney's finest. Run by the Historic Houses Trust, it is situated inside a colonial police and court building, and examines the social history of law, policing and crime in New South Wales. Its exhibitions – both permanent and temporary – are fascinating. Inside, you'll learn all about Sydney's colourful criminal past. Want to know when and why the state's police were armed? Well, it occurred after the Bridge Street Affray of 1894, when three fleeing safecrackers used iron bars to brutally bash the police who chased them. Wondering when the first successful prosecution involving fingerprints happened? It was in 1904, when poor Henry Hunter learned the hard way that breaking and entering without gloves was no longer wise. The cast of characters connected to the old police and court building includes such notables as Captain Moonlight and Jimmy Governor. Furthermore, you'll discover evidence from infamous homicides like the Pyjama Girl Murder and the Graeme Thorne Kidnapping. And there's also a charming collection of stabbing and/or gouging implements to peruse. To plan your visit, click here. And to find out what events and exhibitions are taking place, click here.